Dover corp is a dividend champion with 59 years of increasing dividends! They have a chowder rulie above 12.0 and a yield of 2.2%. In the 15 year and 10 year FASTGRAPHS, Dover falls below the average PE ratio (blue line). Dov has a solid credit rating of A and has a debt/cap of 38% which is reasonable. The TTM payout ratio is only 27% which is quite safe. The beta of the stock is higher at 1.48 as expected from an industrial sector stock. 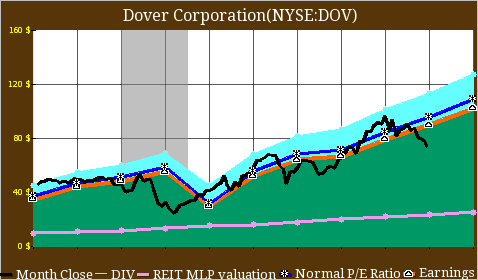 S&P gives Dov a $90 12 month price target which means a discount of 15.9%. S&P rates this stock as a Buy. In addition to Dov, I find NSC and SWK interesting as well. Railroads took a slight beating from the fall of oil prices (I don't think this is justified since oil demand will go up with lower prices). NSC has only 13 years in div history, which isn't bad. SWK is a wee bit expensive compared to its historical PE. S&P recommends to Hold both of these stocks and Jefferson Research recommends a Buy for both. Other railroad stocks include UNP, CSX, and CNI. These other names however are quite expensive as they have recently lifted off into the stratosphere. I wouldn't mind adding to my position in UNP though due to its growth prospects. I am also still closely watching the following energy stocks: BP, COP, CVX, XOM, RDS.A. I am willing to wait on BBL as well. It is still in the "falling knife" mode. I am not a big fan of BBL as it's behavior as a stock is quite volatile for me. Sorting Fish's dividend champion spreadsheet by the Chowder rule and then picking stocks with reasonable yields I have the following stocks. This is only a preliminary screen and isn't a recommendation of picks since some are PE expensive or have other issues. Thanks for sharing your analysis of DOV. You also mention many other interesting names such as BP, COP and others. I like BP and that juicy yield is really tempting. I also agree with your assessment that we are still in the falling knife mode which is why I'm still on the sidelines for now. I just added bought two companies for December not in the energy space. I may make an energy buy soon though.